I know what you’re thinking. “We don’t even have 20 employees, so why do we need a management system?” You might be thinking this because you previously worked for a larger company and one of the things you hated was death-by-meetings, decision-making red tape and excessive processes/procedures. Or you might not yet know what a management system is but it sounds burdensome. But every company needs a method to their madness – a way of getting things done, deciding what to focus on and communicating to the team so everyone is pointed in the right direction. That’s a Management System. Now you just need some tips for how to right-size a management system for your stage of company evolution so that it is most effective. This article focuses on the very early stages. When I advise startups, one of the things I commonly do is try to figure out their management system. Without even thinking about it, most early stage companies decide to huddle up on some regular frequency (daily, weekly, monthly) for various purposes. Maybe each morning with coffee and bagels the founder and her two developers talk about the code that got checked in the day before, the new bugs that were reported and the development tasks for the new day. And perhaps weekly the business-oriented co-founder and their marketing freelancer review various metrics regarding new software downloads and conversion rates to a paid license before sending an email with that info and some directional guidance to all 6 employees in the company. In its simplest form, these sorts of activities create the start of a management system. 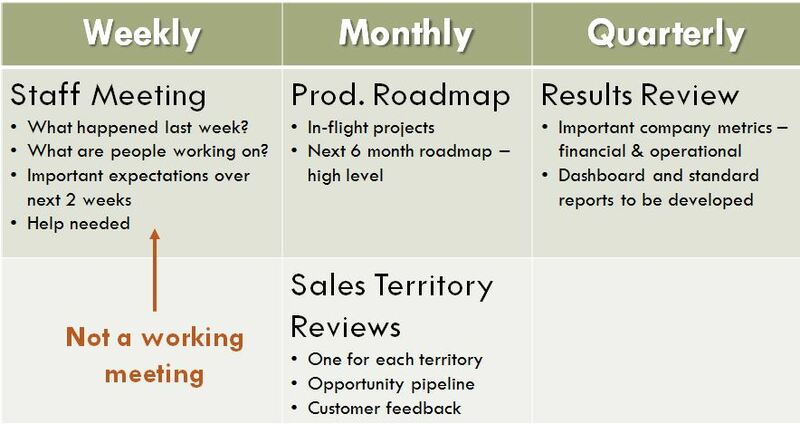 I gave a brief example of this above but let’s break down the important aspects of recurring meetings to see how it greatly defines your management system. For any given recurring meeting, why do you have it in the first place and what outcomes or benefits are expected as a result? Use the answers to these questions to give the recurring meeting a meaningful name. The purpose should be communicated and understood by all regular attendees to avoid “purpose creep” and excessively long meetings. In other words, if you hear someone say “since we’re together, I had something else I wanted to bring up”, the purpose of the meeting just expanded. That might be fine but if it happens regularly and for the same topic of discussion, decide if the purpose of the recurring meeting should be expanded or if another recurring meeting should be set with a specific frequency and list of attendees. How often is the recurring meeting needed in order to maximize value? If too frequent, then not enough will have changed since the last meeting. Not frequent enough and you won’t be able to react/adjust quick enough to important issues and opportunities. Who needs to be present in order to maximize value? Something like daily code reviews only require the developers while all employees and advisors might be needed for the monthly/quarterly results review meeting. I’m not suggesting that you get overly analytical in this exercise or spend too much time thinking about it. But once you’ve figured out the why, when and who aspects of your recurring meetings, consider depicting it graphically so that you can see this important aspect of your management system altogether. Use the graphic with your advisors and employees so they can see the big picture too. Below is an example of something that might be appropriate for the early stages, after your product is in the market and earning revenue but before you have 50 employees. Also, when you hire a new employee, use a graphic like this to help explain your management system during their on-boarding process. After important discoveries, make sure to share the information with the team. This could come from a meeting with a strategic customer, business partner or investor. Or perhaps someone went to an industry conference and learned a lot. It’s customary to provide investors and advisors with periodic updates on the company (results, successes, discoveries, issues/risks, etc). Why not send that same information to the employees? Think about having periodic meetings with all employees (often referred to as an “all hands” meeting). When you have fewer than 20 employees, you can just huddle up in an open part of the office and take 15-30 minutes to cover some highlights. As you grow and have remote employees you’ll need to consider using technology like videoconferencing. How do you decide to do one thing but not another? Do your decisions tie back to a strategy or recent business plan? Do you have any founding principles that guide your decisions (see related article titled “Founding Principles – Do You Have Them?“)? How about quarterly goals for each function or employee that can help drive their decisions (checkout the online solution from Khorus)? Having an effective decision-making framework and culture can really make the difference in your eventual success. If instead you find that you make most of your important decisions based on gut feeling and instinct or huddle with your management team to argue a particular issue until a consensus is reached, you’re missing an opportunity. If you’ve never really thought about how your company makes important decisions, wait until it happens the next few times and then reflect back when you’re done to see if strategy, goals or principles helped guide you. Your company will develop a management system whether you want one or not – just like a company culture. So you may as well do some thinking about it in the early stages to set things in motion that match your personality and desired culture. Your management system will also need to evolve over time as the complexities and needs of your business evolve. Using a startup management system after you’ve reached $10M in revenue is no more effective than trying to use IBM’s management system at a startup. So consider stepping back once per year or so and evaluating your management system using the three categories described above.